If you like this free plugin please don’t forget to spread the word, like it, share it so other people can try it too. Thanks in advance! Post Custom Templates will help you in changing your theme’s default template for single posts. Create custom templates – fast & easy. 18 ready to use templates. OTW Grid Manager full version – drag & drop enabled to rows and columns too; easier and faster way to insert rows with columns; row settings – full width background color, animation, image, pattern, video, Parallax effects, Background filers and gradients; Full width content and full row height too. Change template for all post from category. Change template for individual posts. Single posts additions – Tabs, Reviews, Handpicked related posts, OTW Fields. 5 Media Types – Image, Slider, Youtube, Vimeo, Soundcloud. 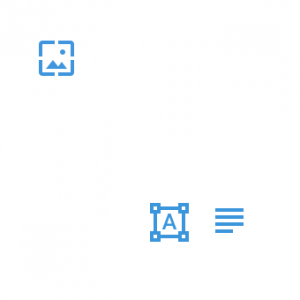 More template options – Horizonta or vertical meta, Meta icons or labels, custom icons and labels, separators on or off, meta styling and positioning. Related post count per slide. Translation/Localization .po/.mo files ready to use. Install the plugin just like any other WordPress plugin. Here is an article on how to install a plugin in WordPress. Create custom template – fast and easy via the editor, no coding. 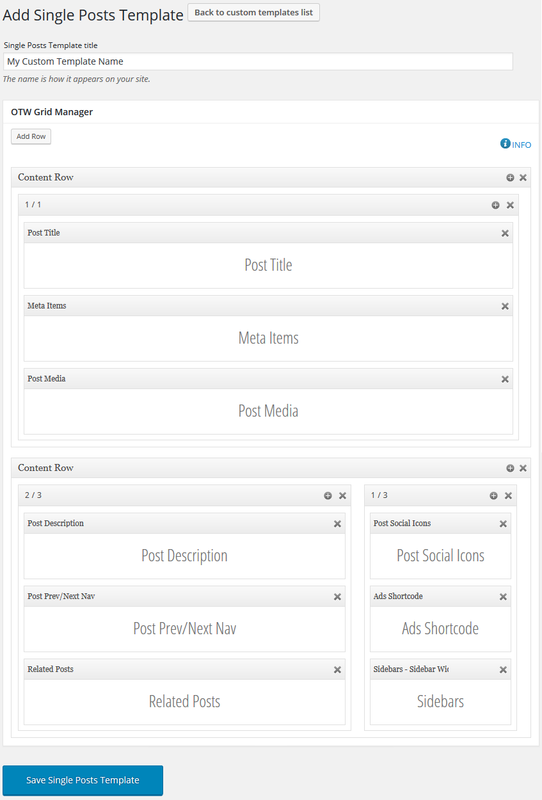 To create a new custom post template simply go to Post Custom Templates -> Add Template menu. In the OTW Grid Manager metabox you can add rows and columns to create the layout that you want. Then in the columns you can insert post attributes – title, media, description, meta, comments, next/previous navigation, social icons, related posts, author info, facebook comments, breadcrumbs, ads, sidebars, etc. 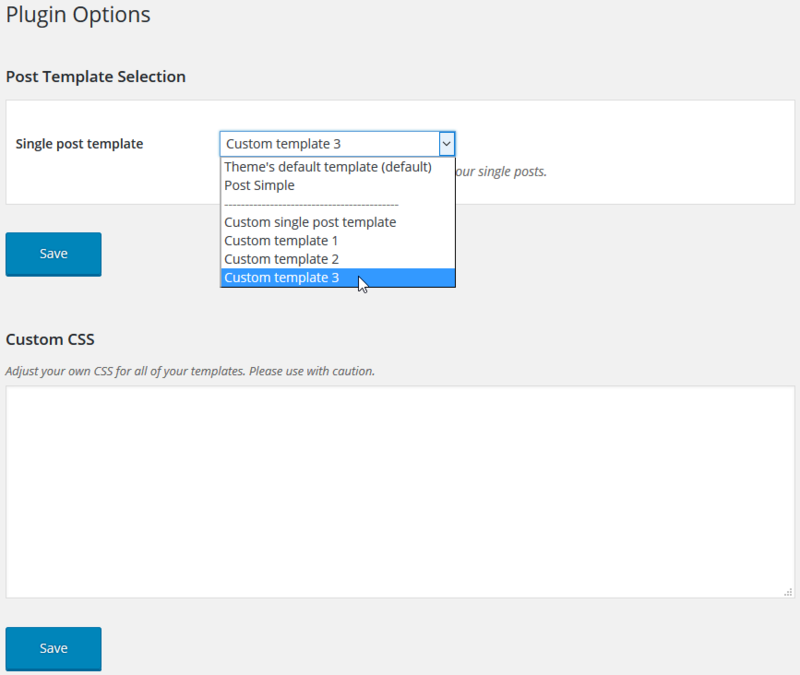 In the OTW Post Template Options metabox you can change some of your template’s default settings. Some of the post attributes/items have their own options that can be found in each attribute lightbox triggered from the edit button on each attribute. 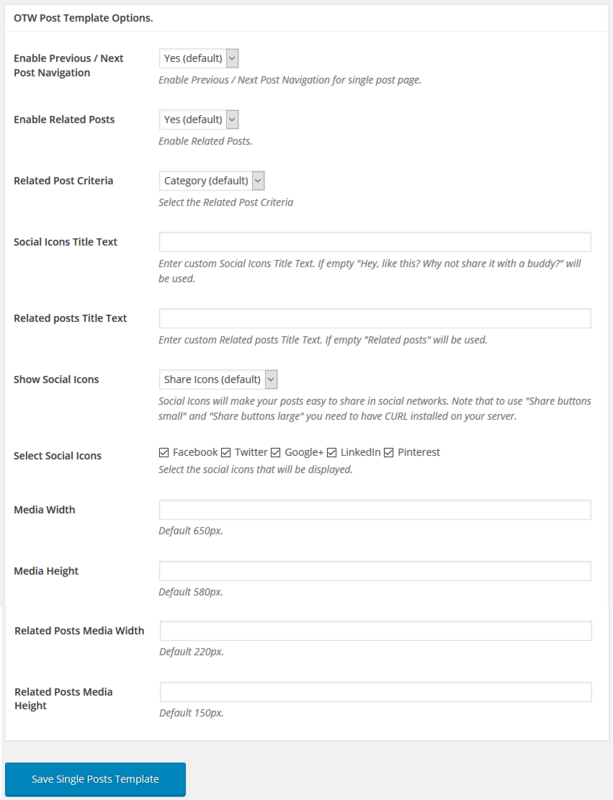 Here is a list of those post attributes: Meta Items, Divider, Sidebars, Ads, Post Facebook comments. To edit an existing template go to the list of all created templates: Post Custom Templates -> Single Posts Templates, select the template you want to edit and start editing. Once you are ready hit Save single post template. To change the default post template of your theme with the once you just created go to Post Custom Templates -> Options menu and select your template in the Single post template dropdown menu. Hit Save. This plugin comes Localization/Internationalization ready. It is following WordPress I18n standards. Generate your .po .mo files and start translating. Since this is a free item, it is distributed as is without any support included. Feel free to modify the plugin however you like though.